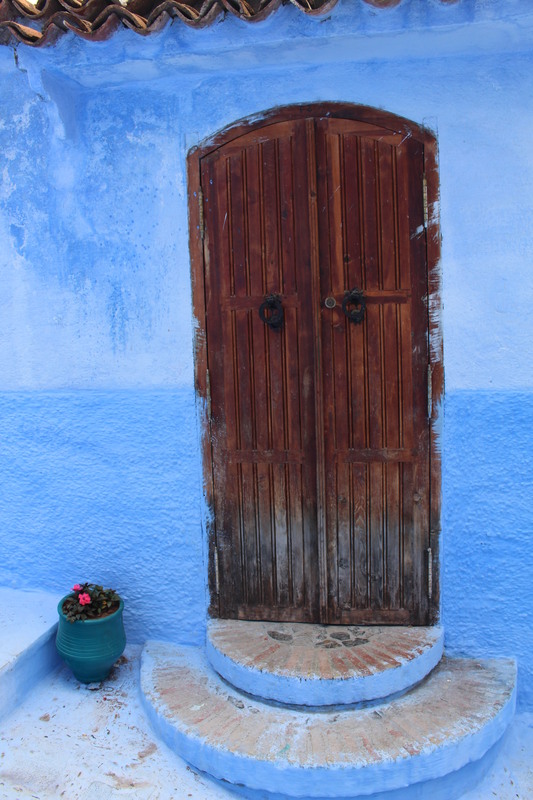 Best Doors of 2018: Chefchaouen, Morocco | Oh, the Places We See . . . In looking back at 2018 — as Norm who has created a series of posts called Thursday Doors asked bloggers to do this week — we can’t help but post photos of a town in Morocco we put high up on our top spots to see in that colorful country. And the walking tour through the little city of Chefchaouen remains one of our fondest memories of our three-week adventure in Morocco. A walk through Chefchaouen takes you past shopkeeper’s wares, through blue-painted arches, and over uneven cobblestone streets. Chefchaouen, originally called Chaouen, meaning “peaks,” sits firmly among the peaks of the Rif mountains. In 1975, the town was renamed Chefchaouen (Look at the Peaks). It’s a colorful white-and-blue montage of buildings that can be seen from a pull-out along the highway. And the doors, windows, flat roofs and scrunched-up living quarters make for a memorable view from the road. From the highway going in to this city, this is the initial view of the colorful “Blue Pearl” of Morocco. A little rock hut with a blue door of its own welcomes you along with the flag of Morocco. 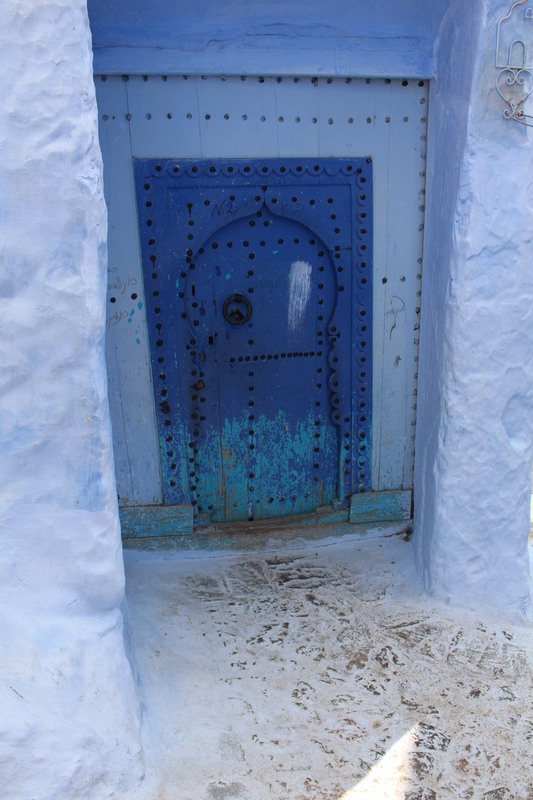 An inset blue door surrounded by white welcomes visitors to this town that is now discovered and “on the map,” so to speak. 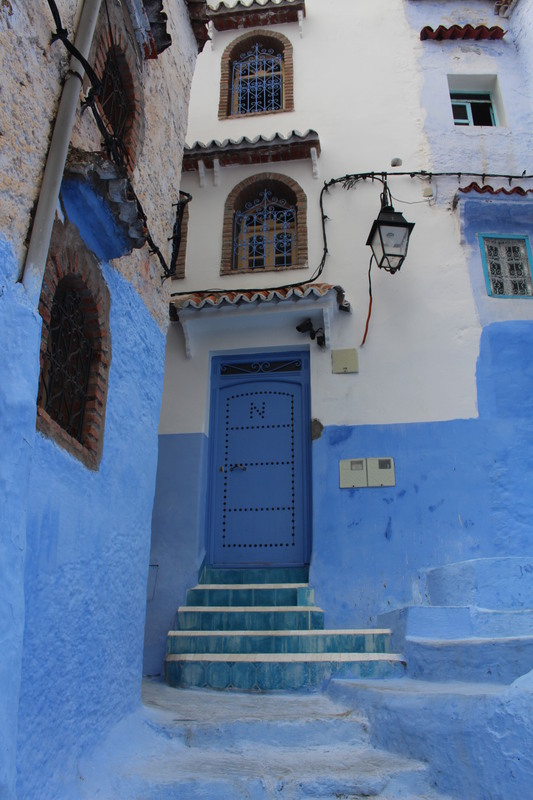 The town, founded in 1471, began to grow quickly with the arrival of Jewish and Muslim refugees from Granada in 1494 who bought up the smallish tile-roofed abodes that lend a Spanish look to Chefchaouen. Dry pigment awaits buyers in Chefchouen. When mixed with a bit of water, it defines this little city known for colorful walls and doors. 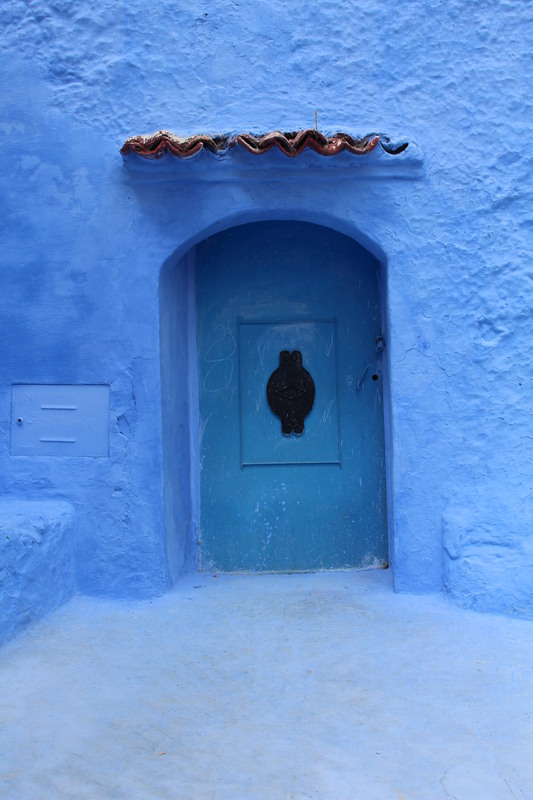 But it’s the blue you want to see — sort of a watery wash of blue that pervades the town as if residents bought the color in powder form, used a little too much water, and slung the paint willy-nilly all over the walls and steps and doors. Blue steps lead to a blue door at a residence in Chefchaouen. No one cares much about detail. It’s the blend of sea blue, sky blue, marine blue and baby blue with pure white that sets this town apart. And the doors provide details, varying in form and construction and history, making you wonder why did they select that style, who lives behind them, and what their story is. A little age and some sloppy painting make this a door to remember. Doorways invite you to climb the steps and pose for pictures as we did — often! under a blue arched doorway in Chefchouen. But sometimes, we just stood still, watching residents going about their daily chores. A man in Chefchaouen sweeps off the walkway in front of his door. Some doors are almost obscured as goods (mostly for tourists to take home) frame the openings, making you wonder what’s inside. And, as we can attest, if you walk in, you’ll probably walk out with more than you came with! Leather goods, perhaps made at the tannery in Fez, frame a doorway in Chefchaouen. Just off the town square, Alcazaba, a fortress built in 1471, offers more glimpses into the architecture of this well-preserved building that’s now houses a museum. Alcazaba, the kasbah in Chefchaouen, opens off the town square. 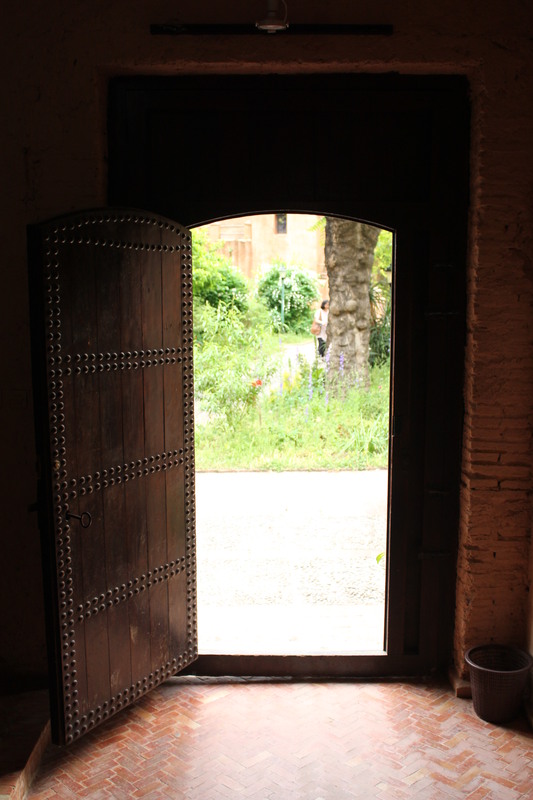 Doorways inside the Chefchaouen kasbah museum. 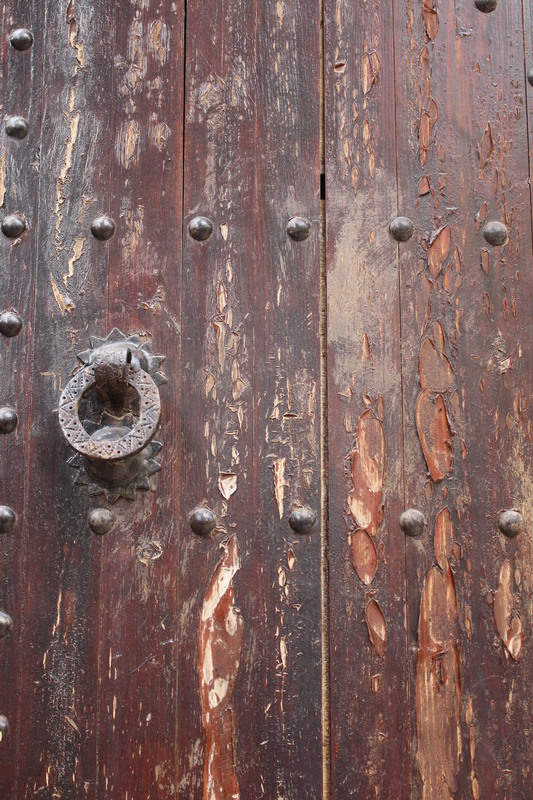 Detail of a heavy door in the Chefchaouen kasbah. View of the courtyard in the Chefchaouen kasbah museum. 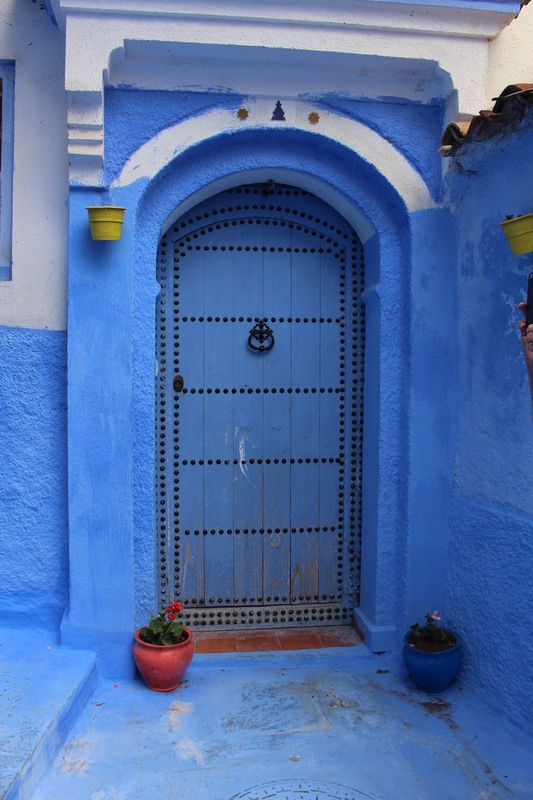 Of all the sites we saw in Morocco, the town of Chefchaouen remains one of the most memorable — from its colorful blue walls, steep steps and simple, yet fairly complex doors. “The Blue Pearl,” as it’s called in several guidebooks, is one town you don’t want to miss in this country that seems to have it all. Best thing to do in Chefchaouen? Wander through the blue. For more Thursday Doors, click here. For more about Morocco, go to Marvelous Morocco in the bar at the top of this blog. 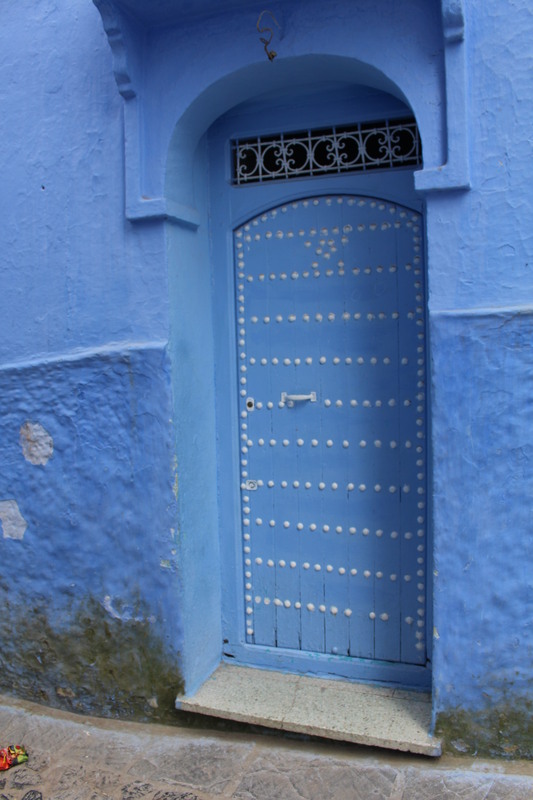 This entry was posted in Destination, Marvelous Morocco, Morocco, Photography and tagged Blue Pearl, Chefchaouen, doors, Lauren Gunnels, Morocco. Bookmark the permalink. 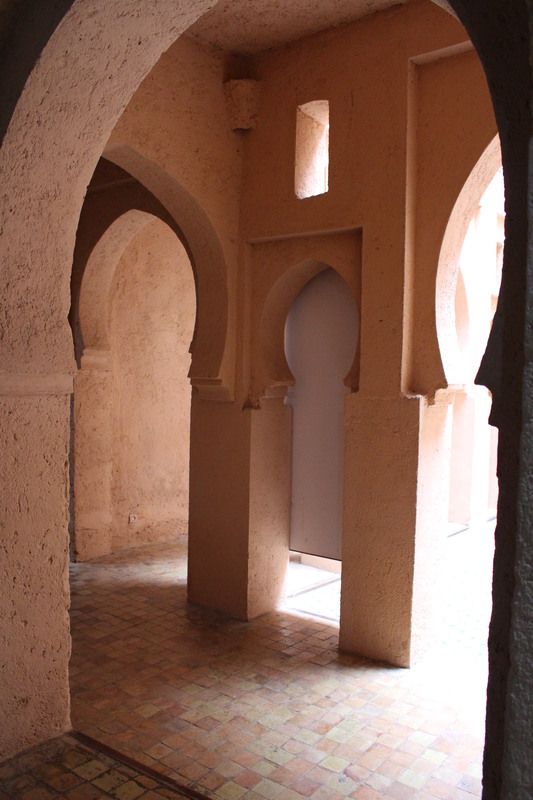 Great blog on Morocco! My son and I are going there at the end of this month. We are staying at the same riad you stayed in chefchaouen. Is the restaurant you went to good? Since we o love you have one night there, might as well go to the best one. Wonderful photos. I am particularly fond of the one of the man sweeping and the one of the bags of dry pigment. But they are all remarkable. It is hard to imagine that blue can be, well, so blue!! We have been to Morocco now three times but have yet to make it to this blue city. Oh well, perhaps next time. Thanks for sharing these lovely photos. You’ve selected two of our fave photos as well. Chefchaouen is one of the most interesting little towns we visited in Morocco — mostly for the signature blue color but also for the shops. We were able to bargain for hand-carved camels, colorful tops, and other little gifts to bring home and add to our children’s Christmas stockings. So much history here. But what we really enjoyed was sitting in the square watching people go by! Dawn, it was MOST interesting. We could tell from the tour books that it was a place we wanted to see, and it did not disappoint. In fact, tour books only show you the blue walls, not the tiny steep pathways, the everyday people doing everyday things, and the views from the rooftops. All great memories. Here’s to a very Happy New Year for you! 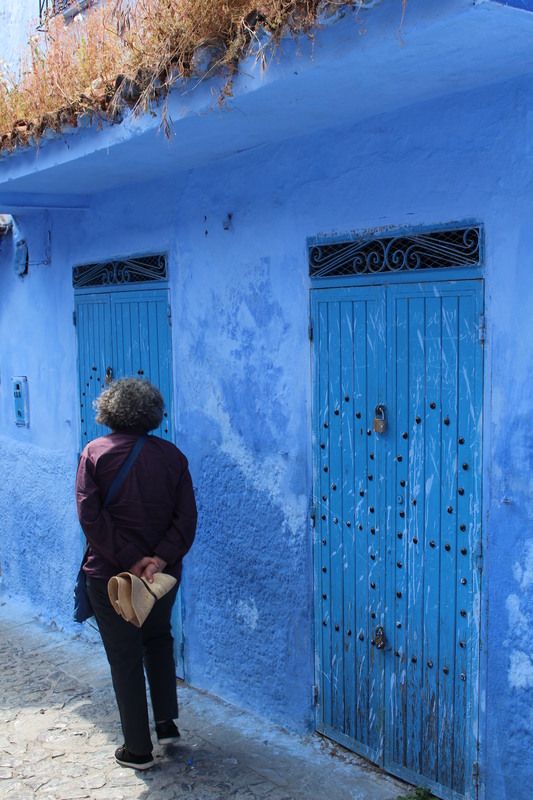 Thanks so much, Sue, for getting into Chefchaouen through our eyes. It was a marvelous town, maybe for the color but also for the people we met and the interesting places we peeped into. Best wishes for a wonderful new year! Thank you! And season’s greetings to you and yours! Beautiful colors in your photos. The blue is extraordinary! After looking at the first photograph, I immediately had kitchen equipment lust when seeing the metal trays, jugs, mortar & pestle, an what look like those flatish metal pans that are put on coals to cook delicious Moroccan food. The blue wall and archway are beautifully set off against the striped orange fabric. It looks like you had a fabulous holiday.